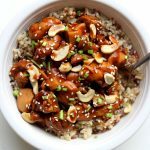 Instant Pot Cashew Chicken–this cashew chicken is just as good as your favorite Chinese restaurant. It’s super easy and flavorful and it’s all made in the comfort of your own kitchen. The instant pot speeds up the process and helps get dinner on the table in minutes. 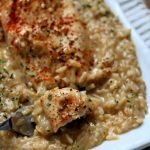 When I cooked every day for a year in my slow cooker I came across many wonderful slow cooker recipes. 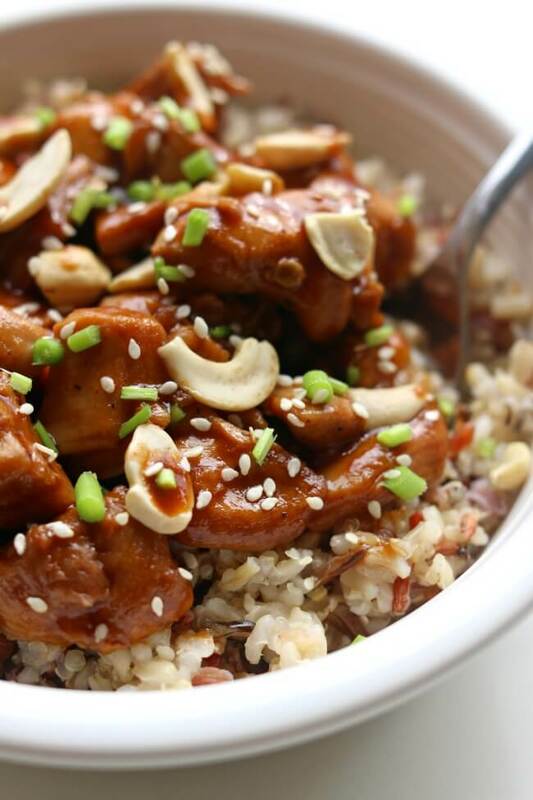 The slow cooker cashew chicken was one of my family’s favorite. Now that I have an Instant Pot I wanted to see if I could make cashew chicken in the pressure cooker to speed things up a bit for those days when I haven’t planned ahead. I changed a few things around in the recipe to account for the differences in IP and the slow cooker. It turned out really nicely. We served ours over rice with a side of broccoli. 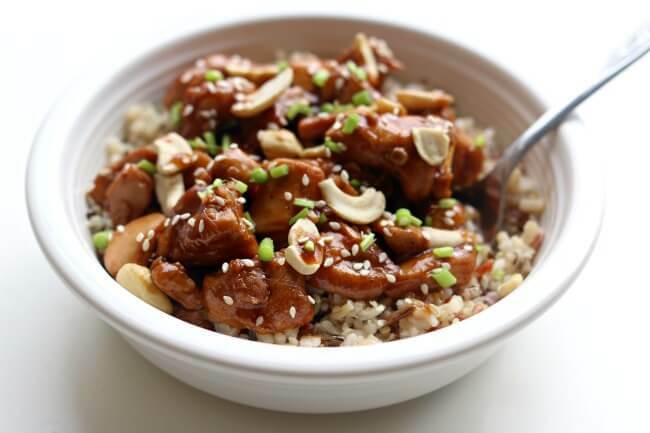 To make instant pot cashew chicken I used my 6 quart Instant Pot Duo 60 7 in 1 for this recipe. I also own the 6 quart Instant Pot IP-LUX60 V3 Programmable Electric Pressure Cooker. They are both great pressure cookers! The first one I mentioned has a yogurt making function but other than that they are fairly similar. The price difference between the two is about $20. 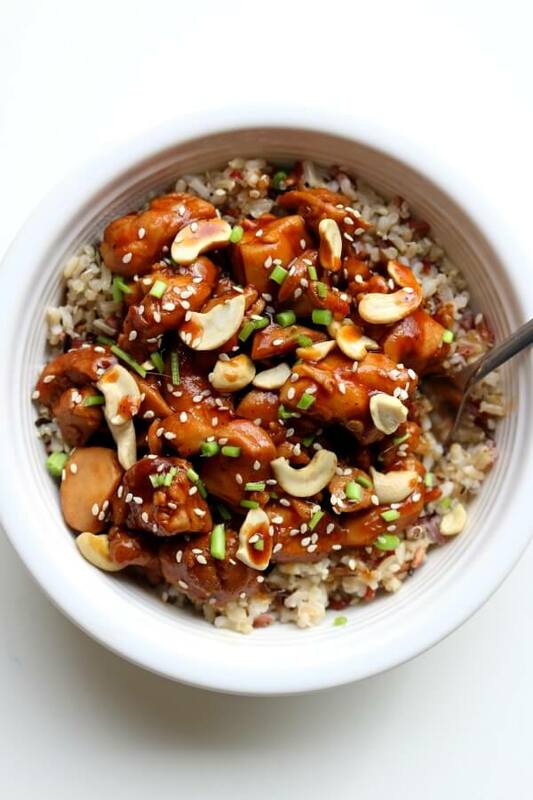 This cashew chicken is just as good as your favorite Chinese restaurant. It’s super easy and flavorful and it’s all made in the comfort of your own kitchen. The instant pot speeds up the process and helps get dinner on the table in minutes. Use kitchen shears to cut all excess fat off the chicken thighs. Then cut the chicken into bite-size pieces. Place them in the Instant Pot. Add in the pepper, soy sauce, vinegar, ketchup, brown sugar, garlic, ginger and red pepper. Stir to really coat the chicken with the sauce. Cover the Instant Pot and make sure the valve is set to “sealing.” Set the manual timer to 8 minutes on high pressure. When the timer goes off do a quick release. Once you can remove the lid, do so. In a small bowl stir together the cornstarch and water. Stir the slurry into the instant pot. Turn the Instant Pot to the saute function. The sauce will thicken in just a couple of minutes. Stir in the cashews. Serve chicken topped with green onions and toasted sesame seeds. 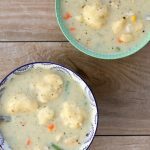 I used my 6 quart Instant Pot for this recipe. If you’d like to make this recipe in the slow cooker, you can click here for the recipe. Use the pressure cook button in place of any recipe that says “manual” button. They are the same thing. Just named differently. You could double the amount of liquid to prevent burn signal. I’m new at this, if I double the recipe do I double the ingredients and the time?? Double ingredients and keep the time the same. Can you use frozen chicken breasts? 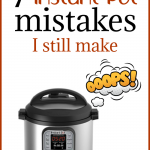 How much longer in the Instant Pot? No, not for this one. Because of step 1: Use kitchen shears to cut all excess fat off the chicken thighs. Then cut the chicken into bite-size pieces. Place them in the Instant Pot. I made this last night. I used chicken breast, no salt buillon and water, very low sodium soy sauce, and no salt ketchup. I also had to make my own hoisin sauce ( low sodium), but it all had a good flavor. I would not add the cashews until I was ready to plate this dish. I did not like the very soggy nuts. Thanks for the recipe- it was my first IP to cook. Hi Jan, I’m glad you could make this work for you! If you wanted to cook the rice in the IP, could you do it at the same time as the chicken? Or would you have to cook it separately? If same time, when would you add? I would add the rice and water to the pot. Then place the chicken and ingredients in a pot that fits inside your instant pot. Use a trivet to place the pot into the pot. If you’re using white rice it should work. This is interesting, I’ve never heard of doing this. I have basmati rice, would this method work do you think? Does it change the cooking time at all? I have chicken breasts, so would probably cook for 4-5 minutes. Yes I think it would! Use 1.5 cups water to 1 cup of rice. I made this recipe tonight but tweaked it. I first cooked frozen chicken breast in the ip then cut it into bite sized pieces…mixed the rest of the ingredients in sauté and it was yummy!!! I don’t know how 1/4 cup of soy sauce would have been enough liquid but this way was yum! That is my thought. I am trying and hope to not get the “burn” notification. I make it a couple times every month. It is one of our favorites. Quicker than to order in and tastes better. Raw or roasted cashews? What is the spice level if made exactly to recipe? We like it to hurt a little but still keep the flavor balance. This isn’t spicy at all Linda! And I believe I used roasted cashews! Just made this tonight and it’s awesome! It’s the first thing I’ve made in my new instapot. I added shredded carrots, water chestnuts, bamboo shoots, and 2tbsp peanut sauce. It turned out so well! I will definitely be making it again soon. Thank you! Hi Kim, is yours a 6 quart? That’s what I used and it worked fine. Sometimes chicken releases liquid when it’s cooked so that adds to the liquid. If you’re worried about it coming to pressure you can always do the pot in pot method. Just get an oven safe dish and put the ingredients inside it and place it in your instant pot on top of a trivet. Then pour a cup of water in the bottom of the pot. Add about 5 extra minutes to the cooking time for this method. This is a very American-ized take on Cashew nut chicken, made it last night. I recommend more soy sauce and adding onions, bell peppers for more taste. How much more soy sauce would you add? I added some pineapple chunks, pineapple juice and broccoli at the end when sautéing to thicken! So delicious!!!! I think that somewhere you said don’t use chicken breasts in this recipe. I just spent an hour de-fatting my chicken thighs and ended up with about a pound of fat and unusable chicken. Why can’t you use a less disgusting part of the chicken? Otherwise this recipe is DaBomb!! 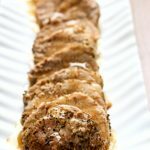 You can use chicken breasts. But it just won’t taste as good. It won’t be as tender and moist. If you do end up using breasts then the cooking time will only be 5 minutes. I’ve noticed a big difference in fatty clumps between “bargain” thighs and premium brands. The premium brand thighs are much better trimmed – less waste & less time spent getting remaining fat deposits out of the meat. Also, I recently invested in kitchen shears – huge time saver over using a knife (and I keep my knives *sharp*). I shop at Hy Vee, the meat department will debone and save bones and skin. Just ask. I boil the bones and skin with carrots, celery and onion. Then strain it for chicken broth. Usually, I have enough meat from the bones to make chicken and noodles. We just got our instant pot this week. Last night, I cooked half of a turkey breast in it and the other half in the oven. The full breast was too big for the instant pot. The instant pot was done in 22 minutes, while the oven was 2.5 hours. Both were very tasty. Instead of cooking the (1”) cubed thighs for 8 minutes on high, QPR, I cooked them 4 min on *low*, NPR for 12 mins. Then took the meat out so it wouldn’t overcook while boiling/thickening the sauce with the slurry. Results in *very* tender, perfectly cooked chicken. If I wanted to add chopped vegetables (broccoli and a bell pepper), when would be the best time to add them in? Do you have a recommendation on how to cook them in the instant pot? I’m a newbie! Good question! For more tender vegetables I’d add them at the end when you make the cornstarch slurry. They’ll get overdone if you cook them from the beginning! This recipe looks and sounds delicious! I’m kinda unsure about making it though. All the recipes I’ve tried have a lot more liquid in them to get the cooker up to pressure. If you’re unsure you can always put 1 cup water in the bottom of your pot, place a trivet on top, then pile the chicken ingredients into a oven safe dish that fits inside your instant pot. Then place the dish on top of the trivet. This will ensure the pot reaches pressure! This looks amazing! Are the cashews salted or unsalted? Thanks! 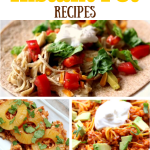 I make this in the slow cooker but brown my hicken first. Can I brown it first in the instant log on sauté then cook for the 8 min? yes that would be so good. This looks so good. I would really like to try it! I am a newbie too. One question, is 1/4 cup soy sauce all the liquid needed to pressure cook in the instant pot! Yes, it worked for me! 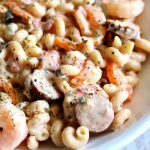 I’m a newbie to instant pot. You mention in your recipes to make sure it is on high. How do I know if it’s on high or not? I’ve read and reread my book and can’t figure this one out. I have two instant pots and one gives the option of changing the pressure from low to high and the other does not give the option. I’m guessing you have the second one. Don’t worry about it because it will be cooking on high pressure!